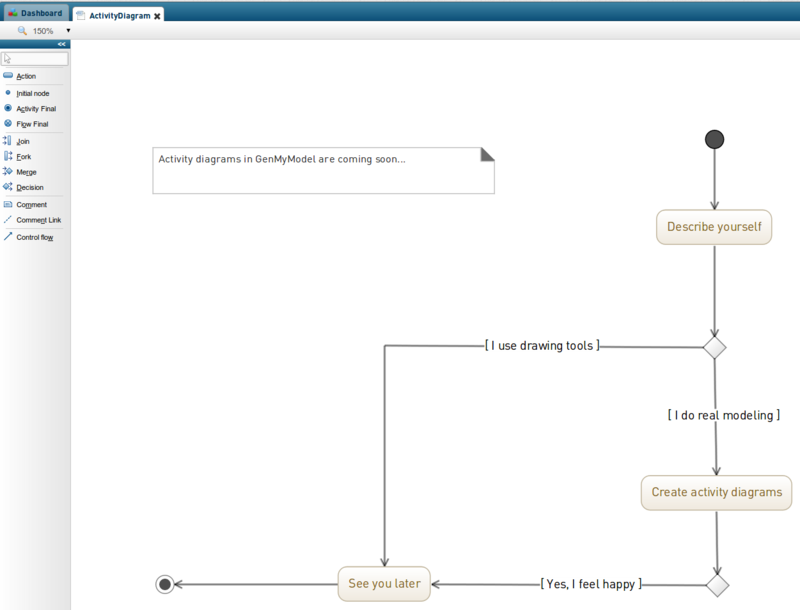 Activity diagrams will be available at the end of our next dev sprint, most probably on December 22. Some kind of Christmas present for all the folks who need to design processes and workflows using UML activities. And I promise an enjoyable user experience!, similarly to what you can feel when designing class diagrams and use case diagrams in GenMyModel. Every journey starts with a single step and there’s still a couple of things to develop and test. But we’re getting close to the first minimal version. Under the hood, a few concepts of UML are being implemented and the image generators need to be adapted. Have any idea for the layout, color theme, behavior, whatever? Leave it below, we’d like to hear from you. And stay tuned for the release announcement!